Coaxial vs Component Speakers. Which Ones Are Best? 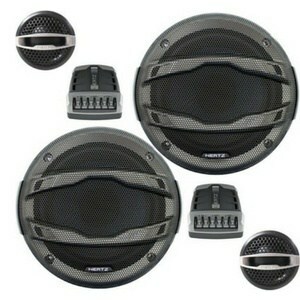 There are a number of factors that go into deciding what speakers will work best for different car audio applicatio​ns. If you've read our article where we review the best car speakers​ available on the market, you've probably seen all the differences between speakers. In this article, we will examine a few aspects to take into consideration when deciding which speakers to select for your install. As the title suggests, we will focus on the difference between coaxial and component speakers and outline a few common applications of each type of speaker. As a general rule, component speakers are going to sound better than coaxial speakers, however there are a few tricks that can be helpful to getting the best sound quality out of each type. 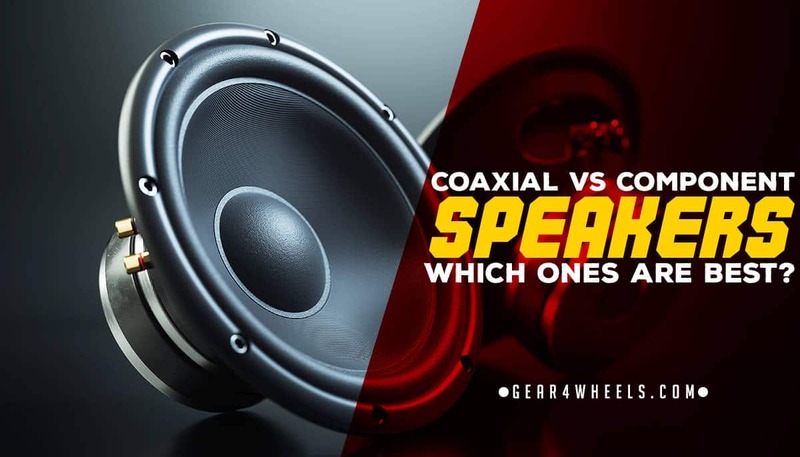 First off, let’s take a look at the difference between coaxial and component speakers so you are familiar with each type of speaker and the differences between them. The top set of speakers pictured is coaxial set, while the bottom is a pair of component speakers. As you can see, the main difference is the tweeter location and addition of an external crossover with the component set. Coaxial speakers combine the mid-bass and tweeter into one speaker with the tweeter being mounted in the center above the woofer cone (as well as a small crossover, usually some type of small resistor). Component speakers sometimes referred to as ‘separates’, do not have the tweeter attached to them and are separated from the woofer to be mounted in a different location. The reason this is done is to improve the imaging or sound quality of the speakers. The vehicle audio environment is not an easy place to achieve fidelity due to road noise, size and speaker locations. Audio quality is an afterthought of vehicle manufacturers and the stock speaker locations are often not the ideal place for sound quality. Car audio manufacturers have come up with a few ways of improving sound quality in the mobile environment, with component speakers being one of them. Typically component speakers are going to be placed with the woofer in the stock door panel location and the tweeter higher up near the top of the door or in the dash pillars. Note: A lot of newer vehicles come with stock “component” speakers, the tweeters being mounted somewhere in the dash pillar area. The reason that tweeters are separated and placed on the top of the door panel or dash pillars is to provide them with a more “on-axis” response. On-axis means that the speakers are facing the listener, while off-axis means they are facing away from the listener, usually perpendicular in the stock door locations. For higher frequencies, it is better for the speakers to be facing the listener. Lower frequencies such as sub bass, disperse at a different rate and are more omni-directional than higher frequencies, so it is less important for them to be on-axis. This is why a subwoofer sounds fine being in the trunk, or behind the listener. Certain speakers are designed to be listened to off axis, while some are designed with on-axis listening in mind. This is why speaker location is an important factor in designing an audio system with optimal imaging. Related: 2 Way Vs. 3 Way Speakers. Many people are not going to want to spend the extra money to have custom fabrication done on their vehicle to build compartments for speakers outside of the factory locations, so many car audio speakers are designed to sound as good as possible in the off axis locations such as door panels. If you do decide to have custom speaker mods done, a popular solution is to place the speakers in kick panels near where the floor and firewall of the vehicle meet. This allows woofers (and tweeters if they are coaxial) to be placed on-axis to the listener. In most audio applications when we talk about getting the best sound quality, the idea is to try to get as close to live sound reproduction as possible. In a mobile environment, if you think of your dashboard as a live stage, we want to get as close as possible to the music sounding as if the band were performing right there on your dashboard. This is referred to as achieving a proper “sound stage”. Since this can be a hard feat to achieve, there are a few solutions outside of speaker placement that are employed to improve sound quality. Imaging is what is referred to as where the sound from the speaker projects itself in the vehicle. Since the stock speaker locations are usually not ideal, this can be improved by using time alignment which delays the music slightly by speaker so that even in different locations, the sound reaches the listener at the same time. Time alignment can be provided by the head unit, or by external sound processors such as a DSP. Before we get too far down the rabbit hole of audio system tuning (and trust me, the hole is deep my friends), let’s get back to talking about selecting a coaxial vs. component speaker. If you are not too concerned about sound quality and just want your music to be louder and more clear than your stock system, coaxial speakers will generally suffice. It should be mentioned however, that without adding an external amp to power them, the volume increase may be negligible. This is where one other important tip comes into play: sound deadening. It is highly recommended when doing speaker upgrades, to add a layer or two of sound deadening product to your doors. This is usually a butyl rubber based product that is applied to the metal door frame underneath the door panels. This helps improve speaker volume and clarity by reducing road and outside noise as well as stopping speaker rattles and damping resonant frequencies. 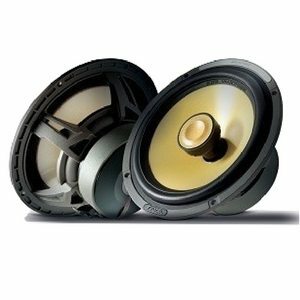 If you are upgrading from stock coaxial speakers to aftermarket component speakers, you will notice a decent level of sound quality as you gain the improvement in imaging by separating the woofer and tweeters. Most component speakers are designed to be run off of an amplifier, so be ready to spend money on both the speakers and an aftermarket amp to properly power them. If you are unsure as to what will sound best in your vehicle, leave a comment reply and I will do my best to help you select the right gear for your ride. Thanks for reading! Thank you for the post. Helped me as a car sound noob. I want to increase the stock sound in my Nissan juke tekna 2014. Trying to figure out what door speakers would be best for my 2012 dodge ram 1500 truck Rockford fosgate compartment power series or the Memphis mcx 692 coaxial speakers, I have 2 12″ Rockford fosgate T1S1 power series with a 1100 Memphis amp and a 250 watt Rockford 4 channel amp for my doors please help me. I currently have a 2014 Ford F150 2 door pickup. I currently have factory stock small tweeters in the window pillars, and speakers in the lower front doors and rear pillars behind the seats. I also have in the system a Sound Ordnance B-8PTD sub woofer. I would also like to put an amplifier in the system . What would be my best options to upgrade speakers. Ignore the tweeters in the pillors, and go to coaxial, or go component. I would prefer sound quality.